In 1824, William Charlton, aged 10, arrived at Quebec from England with his father Edward (1770-1854) and mother Catharine (1776-1864) (Calvert) and 9 brothers and sisters. They then proceeded on their journey to York (Toronto). Living at York until 1838, Edward and Catharine, with most of their family, moved to the Township of Lobo where over a period of 9 years they accumulated 1,400 acres of land from the Canada Company. Eventually this land was inherited by their offspring. William, the 9th child of Edward and Catharine, married Isabella Douglas on December 20, 1844. They had 4 children: Annie, Edward, Catherine and George. George lived on Lot 20, Concession 11 of the Township of Lobo, in a small frame house. He called the farm “Moorguards” which originated from the place his grandmother Catharine (Calvert) was born. At age 34, George married Cecelia Scott on December 26, 1888. At that time, a new two storey white brick house was built to the west of the original house. The 1888 house still remains in the Charlton family, at 11808 Charlton Drive. The frame house was sold and moved one concession south. It is still there today at 11738 Hedley Drive. George and Cecelia had 10 children: Violet, Florence, Clarence, Meredith, Herbert, Roscoe, Madeline, Andrew, Hilda, and Marion. Andrew, the 8th child, stayed on the home farm with his parents. He married Isabel Scott on June 18, 1938. Cecelia lived with them at “Moorguards”. Andrew and Isabel had one son, Leslie. When Les married Diane Bowman on May 5, 1962, Andrew and Isabel built a red brick house on the original site of the old frame house, and re-opened the well that was there from 1838. This house is located at 11814 Charlton Drive. Les and Diane, living in the 1888 farm house, had two sons: Todd and Bradley. Todd, the eldest, married Ann Loft on July 15,1988; they have two children: Scott and Cori. 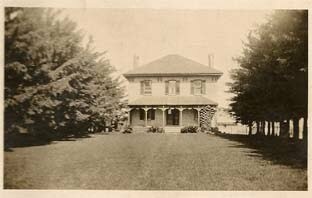 Today, Todd and his family farm, and are living in the 1888 house, at 11808 Charlton Drive. His mother Diane lives next door on the original site of the 1838 frame house (now the red brick house built by Andrew and Isabel in 1962) at 11814 Charlton Drive. Bradley and his wife, Carrie Russell, live in Toronto.